Here’s a quick list of tips and tricks to get you started in God Eater 3. Keep in mind that these are primarily for beginners, but they might even help pros get acclimated to a new type of RPG. Even though God Eater 3 explains the different forms of the God Arc, it doesn’t go into detail on when and how to use them effectively. The primary attack forms are Blade and Gun. These are of course relatively self-explanatory; Gun Form shoots bullets, Blade form is a sword. When attacking enemies in the level, a player might feel inclined to jump right in and start swinging their sword. After all, the gun uses OP and has limited ammo, where as the blade’s stamina bar is practically unlimited. While this tactic may work in the early stages, player’s will find their health bars dropping rapidly if they try the same approach later. The Aragami can dish out lots of damage in a single hit. The safest route is to use gun form to space your way around the monster, getting some free hits off while maintaining distance. Observe the patterns the enemy follows: when they attack, what the range of the attack is, and if they have any movement abilities. Even low level enemies can tunnel underground or swoop upwards. Noticing what the Aragami do before the attack lands is key to avoiding damage when you approach with Blade form. God Eater 3 players will get a brief introduction to the Predator Form of their God Arc as early as Stage 1. This form allows the character to absorb the power of the Aragami and enter Burst Mode. Here they’ll deal more damage, move faster, and get special Aragami bullets. Entering Burst Mode is pretty much the only way to deal any significant damage to higher level Aragami. Make sure you space the character a safe distance away from the Aragami – but close enough that the giant mouth from your God Arc can reach – before activating Predator Form. Sussing out the situation first to spot any tricky monster attacks will guarantee safety during this long move. Once its complete and Burst Mode is activated, feel free to go to town on the Aragami. Teamwork is critical in God Eater 3, especially when playing with actual human players. But even when going into missions with the AI, syncing up attacks and focusing firing on specific Aragami helps in battle. Whenever you fight with a player in a certain range, the Engage Percentage rises. Once full, Engage Effect can be triggered, boosting the power of moves and increasing defense. It’s important to swap up which characters you are fighting next to in order to maximize the use of the Engage system. Fight next to one character and after the Effect is triggered and subsequently finished, try to combo with another. Once the final Aragami is defeated, you’ll be taken back to the Caravan (or hub world at the time). The levels offer a brief amount of time after a victory to explore, but it isn’t enough to grab everything you’ve missed. There are plenty of important and valuable artifacts lying around that you might miss if you wait until after battle to pick them up. Try to explore a bit before engaging (or even during a tough engagement) to guarantee you walk away from the fight with all the materials you need and want. 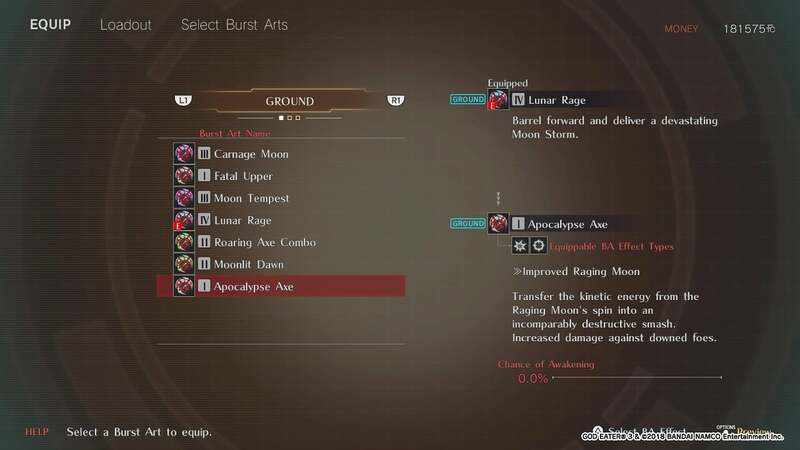 Entering and maintaining Burst is an essential part of God Eater 3; but if you want to use it to its fullest, then you’ll need to make use of Burst Control Units. What Are Burst Control Units? Burst Control Units are one of the many means you have to strengthen your character. In this case, they’ll provide unique benefits such as enhancing the properties of certain techniques, reducing the resource cost of certain actions or even adding properties to certain attacks depending on your current Burst level. Many are quite useful and they’ll allow you to adopt a playstyle that is uniquely your own, but the catch is that you have to be in Burst for them to have any effect so keep that in mind. I’m Sold. So How Can I get Them? The process for obtaining Burst Control Units is the same as with costumes: first you get the respective blueprint and then you craft it. In fact, everything down to the very details are the same so you can follow everything down to the letter with costumes or vice-versa and it will be applicable to the other. There will occasionally be a mission that provides blueprints for a Burst Control Unit, but you won’t know whether it does so in advance, so it’s in your best interest to do them all. These are relatively low in number, though. For the rest, you’ll have to rely on Vagrant Merchant Hope. Vagrant Merchant Hope is a travelling merchant who visits the Ash Crawler Chrysanthemum every three or four missions to sell “a number of odd and unique items.” To find her, wait until a notice reading “Vagrant Merchant Hope Visiting” appears in the upper right corner, and once it does, simply head to the right-most door on the Bridge (if you’re looking down where the terminals are) and she’ll be there right next to the other merchant, Faith, in the Lobby. Outside of being in Burst, the most important thing to know about using Burst Arts is that they essentially modify a weapon’s base attacks. They don’t need unique button inputs or anything like that — just press the same buttons as you before. For instance, Lunar Rage modifies Moon Storm, so simply press L1+Square to pull it off. Meanwhile, Apocalypse Axe modifies your Raging Moon, so let go of Square after holding on to it for a little while to let it rip. It’s also worth noting that some of them have special properties which make them particularly potent depending on the situation. For example, Apocalypse Axe does extra damage to an Aragami who has been downed (such as when you break one of their body parts). On top of unlocking new Burst Arts, leveling them up will result in you learning new Burst Art Effects to further augment your attacks. Each has two different types they can equip, and as you might expect, certain BAs can make better use of them than others. As a rule of thumb, those that can be sustained over long periods of time like Lunar Rage and Moonlight Blade can proc their attached BA Effects several times during their duration.